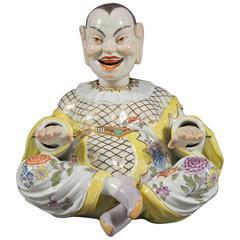 Called ‘pagode’ (or pagoda) figures, these Meissen Porcelain models are based on the sculptures of deities found in pagoda temples in the Far East. Meissen began to produce these kinds of porcelain figures in the early 18th century, prompted by the demand for the Far Eastern ‘pagodes’ being imported into Europe at this time. The Meissen factory in Germany was founded in 1709 and was the first producer of true porcelain wares in Europe. The company’s main patron was Augustus II the Strong, the Elector of Saxony and King of Poland. 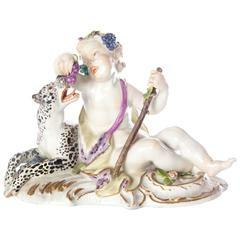 Meissen was, and continues to be, famous for its tableware, vases, candelabra, animal sculptures and figures, like this pair, which were often graceful and light-hearted in character. These models feature the Meissen mark of the two blue crossed swords on their undersides. These porcelain models take the form of a Chinese couple, who sit with their legs crossed. They have large bellies and ears, and broad grins on their faces. Both figures wear parcel gilt collared shirts and loose robes, decorated with colorful flowers. Characteristic of ‘pagode’ figures, the figures' heads nod, and their hands and tongues move. 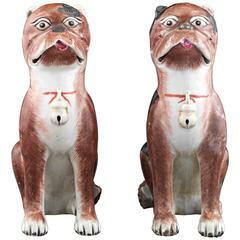 The pair are designed to surprise and delight all who have the pleasure of beholding them.